Mollie Cinnamon is stuck on the snoresville island of Little Bird with her great-granny while her tv-presenter mum, Flora films a new travel show. Mollie is bored, bored, bored until she makes friends at the magical Songbird Cafe. However disaster strikes when the cafe is threatened with closure. Can Mollie and her new friends save the cafe? The second book in The Songbird Cafe Girls series is about friendship, family and a very special cafe. Little Bird Island has been Sunny's home since she was adopted from China. Sunny loves baking and drawing - if only her anxiety didn't stop her from speaking to her friends. Could a trip to China be the key to unlocking Sunny's voice? Aurora, or 'Rory' in this book has a special bond with dolphins. There are lots of dolphins in the waters around Ireland and I’ve been lucky to see them on many occasions. I’ve seen whales too, in both Ireland and New Zealand. I had so much fun researching this book and I learned a lot about sea mammals along the way. 1. Little Bird is such a lovely place. Was it inspired by a real island? Yes, it was inspired by two islands off West Cork, Ireland: Cape Clear and Sherkin Island. I wanted to create somewhere very beautiful and quite magical, like those real islands. But I also wanted to give it rapids, its own dolphin (called Click) and its own special atmosphere. 2. This book is very much about finding a place in the world that feels like home. Where is your favourite place? A tiny village in West Cork called Castletownshend. The scenery is stunning and it’s right on the sea. I love swimming and kayaking and sailing, so it suits me perfectly. I do a lot of my writing there. 3. Who was your best friend at school? 4. Mollie's favourite film is The Wizard of Oz. What's yours? Like Mollie, I’m a big movie fan. In fact, we share a lot of favourites, including The Wizard of Oz and Spirited Away. I also love Field of Dreams. I watch it every year. I love its message – ‘If you build it, he will come.’ Basically, it tells you to have big dreams and to follow your heart. It’s a wonderful, magical film and everyone should watch it. 5. Flora loves her job as a TV presenter. If you weren’t an author, what would you be? A children’s bookseller. My dream is to run my own children’s bookshop one day. Watch this space! 6. Which character from Mollie Cinnamon Is Not a Cupcake are you most like? That’s a hard question. I guess, if I had to pick one, I’d say Nan. She’s a lot older than I am, but like me, she makes mistakes and attempts to fix them as best she can. She also fights for what she believes in and also tries to look after the people she loves. 7. We loved reading about Mollie, Landy, Sunny and Alanna. Can we expect more stories about them? 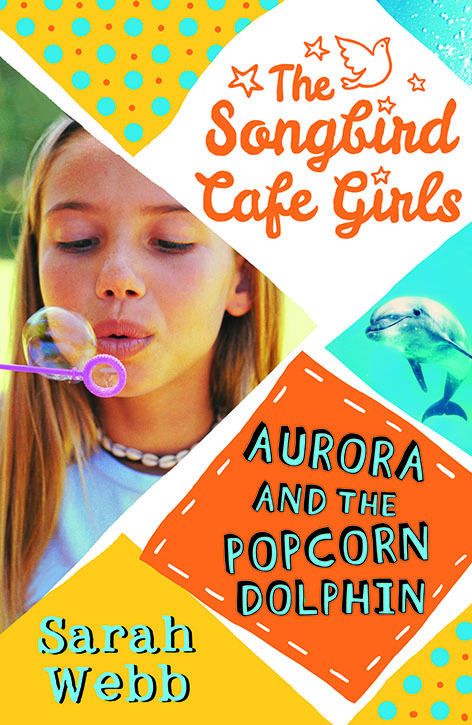 Yes, there are two more books to come, Sunny Days and Moon Cakes - which is about Mollie’s friend, Sunny - and Aurora’s Dolphin about another new girl to Little Bird who befriends Click the dolphin.